What is the Jewish Enrichment Center? 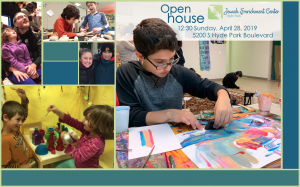 The Jewish Enrichment Center is an innovative after-school and Sunday Jewish education program based in Hyde Park, Chicago, that is beginning to share its groundbreaking model of Jewish education with programs throughout the country. Our community is founded on empathy, collaboration, and creative exploration of Judaism. What Jewish denomination is the Jewish Enrichment Center affiliated with? The Jewish Enrichment Center is not affiliated with any denomination or movement of Judaism, and our community represents a wide range of Jewish beliefs and practices. Many of our families are affiliated with other synagogues or temples in the Chicago area; many of our families are not affiliated with any other Jewish institutions. Our curriculum encourages children to explore Jewish texts and traditions, and to develop their own personal interpretation of, and relationship with, Judaism. Our children and families have a wide range of beliefs and practices around God, Jewish holidays, and Jewish texts. What ages does your program include? We run Sunday morning programming for infants and toddlers, and Sunday morning and Monday-Thursday afternoon programming for three-year-olds through middle school. How many sessions a week do children attend? Our infant/toddler program meets once a week, on Sunday mornings; other groups meet four or five days a week between Sunday and Thursday. Nursery children should attend at least once a week, and children in kindergarten and up should attend at least two days a week, but may register for three or four days as well. Why do children attend at least two days/week starting in kindergarten? The kind of creative, communal, long-term project work we do with children requires them to trust each other, collaborate, and take risks. It takes time to build and sustain the kind of relationships that supports this intensive work. In addition, children need to revisit their thinking about the current theme at least twice during the week in order to continue developing their ideas. To learn Hebrew in a natural way (i.e., through the auditory environment, through play), children need to hear and play with the language multiple times/week. How do I sign my children up? Here’s a link to the online form. And, please reach out to introduce yourself! Contact our founding director, Rabbi Rebecca Milder (rebecca@jewishenrichment.org). Yes. Tuition support is available, and we’d like to spend every dollar of our tuition support fund, every year. To receive tuition support, families should contact Rabbi Larry Edwards (LLE49@comcast.net) for a confidential, low-key conversation. My partner isn’t Jewish / I’m a single parent / I’m raising my grandchildren / My child has two parents of the same gender / We don’t celebrate Jewish holidays at home. Will our family fit in? Do children learn Hebrew at the Jewish Enrichment Center? Hebrew is embedded into the auditory and visual environment, and in the routines of our day, so children pick up the language naturally. Children of all ages play games in Hebrew, often choosing how they would like to engage with the language that day. Hebrew is woven into our physical playtime for younger children, and older children master Hebrew prayers. Comfort with the Hebrew language, and a working vocabulary, are essential to developing confidence in owning the texts of our centuries’-old Jewish conversation. A child who owns these texts can play with Judaism, creating their own meaning in Jewish life and community. What is Shirah/Tefillah (Singing/Prayer), and why should I attend with my child? At the end of every session, the entire community gathers together for Shirah/Tefillah (Singing/Prayer). We sing in Hebrew and English, and children learn the words to the primary Jewish prayers through song. It’s a time to hear special news from the day, get a sense of the big ideas your child is grappling with, and find out what to ask your child(ren) about at home. We strongly encourage parents to make Shirah/Tefillah (Singing/Prayer) a regular part of your weekly schedule. Shirah/Tefillah (Singing/Prayer) is held from 11:25 – 11:45 AM on Sunday mornings and 5:25 – 5:45 PM on weekday afternoons. All adults welcome – grandparents and caregivers, too! Why do you have multiage groupings? The Jewish Enrichment Center offers multiage groupings in all kevutzot (groups). With a broad range of ages, children learn from other children through role modeling, allowing younger children to be stimulated intellectually by older children and older children to develop self- reliance and responsibility. Multiage groupings also promote friendship between children of various ages, which strengthens the community as a whole. Multiage groupings make it possible for children see that each one of us brings strengths and a unique perspective to our community. Do you offer Jewish enrichment when school is closed? Yes! We have full days of Jewish enrichment when local schools are out, called Special Days. We also run full weeks of Jewish Enrichment Camp during selected school breaks. We spend our Special Days and Camp days playing and exploring a Jewish person (e.g., Marc Chagall) or idea (e.g., the tastes of Passover), culminating in big project by the end of the day or week. Since the majority of our enrolled families come from the University of Chicago Laboratory Schools, we hold Special Days on Lab’s parent-teacher conference days, and also on several national holidays. Please check our website for a full schedule of Special Days and Jewish Enrichment Camps for 2018-2019. Do you offer summer programming? In Summer 2018, we’re meeting on two Sunday mornings to play in parks around the city, including some Enrichment Center-style fun. Plus, we send children mail over the summer, with Hebrew games and puzzles and cards. We believe children should get to keep their Hebrew skills sharp over the summer, and see their Enrichment Center friends, too. Jewish Enrichment Camp will run for two weeks at the end of the summer, from August 20 – 24, 2017 and August 27 – 31. Register online today! Do you do Bat/Bar Mitzvah preparation? Yes! We partner with families to design a Bar/Bat Mitzvah experience that reflects the family’s Jewish life as well as the individuality of the child. Children at the Jewish Enrichment Center learn Hebrew, and they learn Jewish prayers and about Jewish prayer services. They develop a relationship with the Torah, learn to express their own ideas about Torah and Judaism, and dialogue respectfully with peers. We teach children how to chant from the Torah. A Jewish Enrichment Center Bar/Bat Mitzvah includes a personalized, long-term project based on the child’s interests or on their Bar or Bat Mitzvah text readings. Can I come visit and learn about your program? Yes! To schedule a visit, please contact Spenser Scheinman (spenser@jewishenrichment.org).